Nearly all works by Donatello elicit praise for their realism. 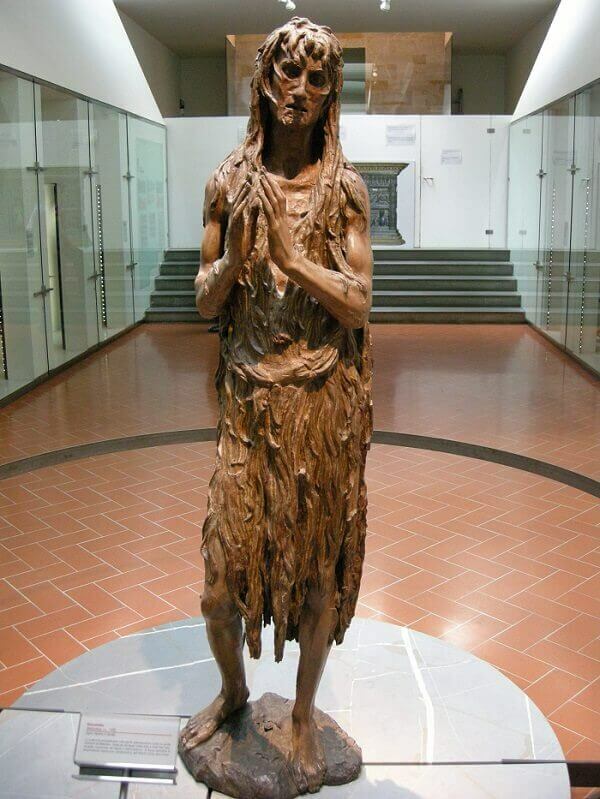 In no work is his skill more evident than in his sculpture of the Penitent Magdalene. It was carved from white poplar wood between 1453-1455 and records indicate Donatello was commissioned by the Baptistery of Florence. Mary Magdalene is one of the most universally well-known Biblical figures. Donatello produced a stunningly realistic interpretation of her character that differed from any other artist before him. It was common knowledge that Mary Magdalene had committed sin and lived a non-virtuous lifestyle. In Donatello's sculpture she appears penitent for her sins with an expression that pleads forgiveness. Donatello's Mary is also shockingly haggard. Idealized portraits in history paint her as being fed by angels and protected from the ravages of age, yet Donatello leads viewers to the assumption that her life of adultery and prostitution has stolen her beauty. She is deeply wrinkled and clothed in rags while her slightly open mouth reveals missing teeth. The Penitent Magdalene is a piece that seems intent on creating a visceral reaction in the viewer. The statue was carved after Donatello himself suffered a long bout of illness in Padua. It seems likely that Donatello's own reckoning with his mortality informed his piece portraying Mary. Donatello's interpretation of Mary is a staggering achievement that encapsulates the best of Renaissance naturalism. The Penitent Magdalene is housed at the Museo dell'Opera del Duomo in Florence.